OBJECTIVE: Preoperative multimodal exercise and nutritional programs(prehabilitation) improve functional capacity and recovery following colorectal surgery. Exercise may also affect cancer outcomes by mediating the systemic inflammatory response. The effect of prehabilitation on cancer outcomes is unknown. The objective of this study was to investigate the effect of prehabilitation on survival after colorectal cancer surgery. METHODS: Pooled data from three prehabilitation trials(2 RCTs, 1 cohort) in patients undergoing elective, biopsy-proven, primary non-metastatic colorectal cancer surgery from 2009-2014 within an enhanced recovery program were analyzed. Patients were grouped into +prehab or -prehab. The primary outcomes were 5-year disease-free(DFS) and overall survival(OS). DFS and OS were analyzed using Kaplan-Meier curves and multiple Cox regression. RESULTS: A total of 202 patients were included(+prehab 104, -prehab 98). Median prehabilitation duration was 29 days(IQR20-40). Patient and tumor characteristics were well-balanced(33% stage III). Postoperative complications and time to adjuvant chemotherapy were similar. Mean duration of follow-up was 60.3 months(SD26.2). DFS was similar for the combined group of stage I-III patients(p=0.244). For stage III patients(Figure), prehabilitation was associated with improved DFS(73.4% vs. 50.9%, p=0.044). There were no differences in OS(p=0.226). Prehabilitation independently predicted improved DFS(HR0.45, 95%CI:0.21-0.93), adjusting for stage and other confounders. Prehabilitation did not independently predict OS. 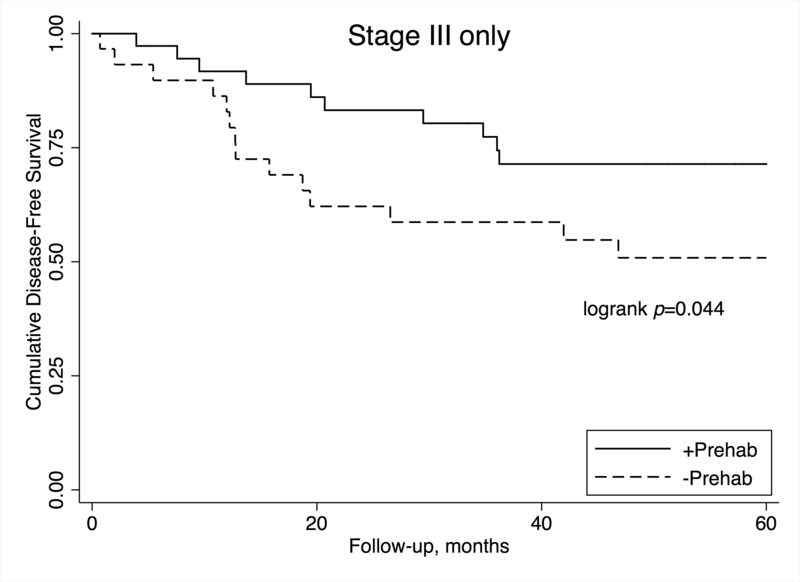 CONCLUSION: In this report, prehabilitation is associated with improved 5-year DFS in stage III colorectal cancer. These important findings should be confirmed in future trials.